With a memorial for Steve Jobs planned to take place at Apple's campus in Cupertino on October 19th, there is talk that the company will allow its employees working in the Apple Store to view the internal ceremony, which begins at 10am local time or 1pm on the east coast. Apple's retail locations are rumored to close for 1 hour on Wednesday between 1pm and 2 pm eastern time and employees will watch a closed circuit broadcast of the services live from the the outdoor amphitheater on the Infinite Loop campus. Flags at Apple have been lowered to half mast. The co-founder of Apple and its driving force, Steve Jobs passed away on October 5th, the day after the company introduced the Apple iPhone 4S, after a long struggle with Pancreatic Cancer. While the one hour shut down of the Apple Stores has not been confirmed by the company, CEO Tim Cook made a reference to it in an email announcing the service. Cook commented that arrangements have been made for Apple employees outside of Cupertino to view the ceremony. The entire state of California will remember the 56 year-old today as Sunday will be Steve Jobs Day, declared by Governor Jerry Brown. A private memorial will be held at Stanford. Jobs brought workers and revenue into the state thanks to the ever booming business done by Apple ever since he returned to the company, replacing John Sculley. From that point in Apple history, Jobs helped the tech giant go from near bankruptcy to the largest company in the world by market cap, at least temporarily, by releasing a string of devices that each became a hit. Well it doesn't matter what you think does it? What Commentator thinks does matter, that's why there is a comment section! See, its right above where it says post comment. :) But I don't think there is anything wrong with Apple having an hour off to pay respects. It's their company, he was the greatest CEO Apple has ever had, and one of the founders of the company. I think its only fitting that they take an hour off. What about Ford, Philips and an other trilion people who ment something for humanity? Ask yourself: would our live be different without Jobs? I guess we would have Nokia's and Sony's or whatever and would be perfectly happy. It's a religion don't expect something sensible from believers. its his company, he made it and he saved it.. to them he is a hero. they have the right to honor the man any way they wish. Steve Jobs=Mind Ninja... even in death. Im a believer in the fact that what i read and hear, is more times than not, not exactly the truth, but what has been constructed and scripted to induce certain emotions and thought process. After all, nothing is labled propaganda when its released... just in the history books 20 years later. 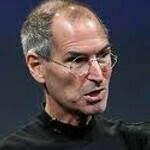 Apple is saying the iPhone 5 was Steve's last endevor. His last will and testament. His last brain child... Well damn, isnt that just fortunate.. Now wont the iSheep feel compelled to obtain such a tribute to their company and savior... Granted its also suposed to be a compleat rehaul, big screen, yada yada yada. but its still going to be lacking in specs compared to other os devices, just as the 4s is now. Yes it is perfectly possible that we only hear the truth from our beloved companys of choice.... but get real people. They dont have HR, PR, and other sections of the companys for no reason. Rant Over..
Steve was 56 years old not 55. Hey he just passed away recently and its only for an hour. I would agree with you if they did this every year or something but let them pay their respects. huhh? because it's one of the 365 days of a year. Nothing special. probably to keep messing with them. they already scheduled his funeral during their original date.. why not keep trying to get them to push it back "out of respect"
Considering the timezone difference between HK and Cupertino, the two events will absolutely not coincide. were the original 2 events scheduled for the exact same time? When I first heard the news of the memorial time, I thought it was suspiciously close to the date of the Nexus Prime announcement. Although the Nexus Prime announcement and the Jobs memorial event are not at the same time, they are close enough that both events will be competing for media exposure on October 19th. The time of the Nexus Prime announcement will be on October 18, at 7pm PDT. The Jobs memorial is scheduled for October 19 at 10am PDT. There will not likely be much media coverage in North America about the Nexus Prime annoucement until the morning of October 19. By then, it will compete with all the Jobs pre-memorial coverage. Even though the events do not occur at the same time, I do feel that the timing of the Job memorial will definitely negatively impact the media coverage for the Nexus Prime. Apple baby!!! you can't touch it! none of these lame computer or phone manufacturers can. Jobs will be missed! Closing for 1 hour will just piss off the unknowing folks who go to the store to do business. Why not make it happy -- as a celebration -- and have a Steve Jobs One Hour Memorial Event instead and offer some ridiculous price discounts or incentives? He would probably appreciate the marketing twist.